Seadna Morey is named at corner-back in the Clare team. CLARE HAVE MADE five changes for tomorrow’s Allianz hurling league quarter-final against Waterford in Walsh Park. Joint managers Donal Moloney and Gerry O’Connor have shaken up their starting side from the draw against Limerick last time out. Seadna Morey starts at corner-back as he makes his first start of the year and Cathal Malone is drafted in at wing-back. The attack sees Aidan McCarthy start at wing-forward, Gary Cooney come in at corner-forward and Aron Shanagher named at full-forward. Rory Hayes, David Fitzgerald, Diarmuid Ryan, Ian Galvin and Niall Deasy all drop to the bench. Throw-in is 3pm. 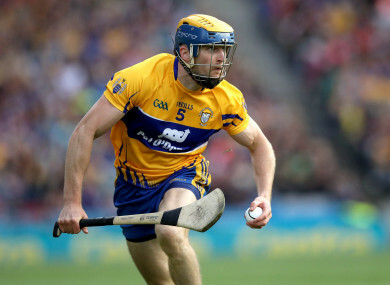 Email “Defender set for first start of the year as Clare make 5 changes for quarter-final against Waterford”. Feedback on “Defender set for first start of the year as Clare make 5 changes for quarter-final against Waterford”.